This simple and sophisticated custom birthstone ring will become a family heirloom. What a precious way to honor the mother of one. How could we improve on our most popular item? Add birthstones of course! This simple piece will become an heirloom you treasure forever. Each sterling silver band will have a birthstone followed by a stamped name, a special word, nickname, bible verse or date ~ it's up to you! 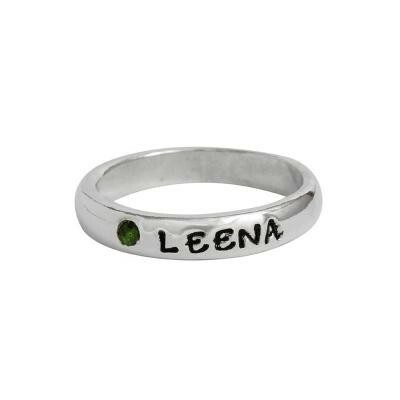 For the mother of one simply put the child's name and birthstone for a meaningful piece of jewelry. Our single rings can be stacked together or worn on either side of an existing ring. Wonderful gift on Mother's Day or a family ring for each member to wear. Personalize with the name of your child or grandchild and their birthstone or put on the word BLESSED, LOVE or a date and the stone for the month you were married or engaged. Our single band is simple and sophisticated. It is a great add on ring if you have ordered a double or triple in the past and then have another child. This single band looks good stacked with our double, triple or our birthstone rings. Ring is made of sterling silver and band width is approx 3mm. 2mm stones represent the colors of each month and are flush set by hand so each setting may vary slightly. If you are considering stacking three or more single bands, we recommend you go up at least a half size. All prices include stamping and the stone setting. We do not offer stamping on the inside of the band. All sales are final.